“Diabetes was a big shock for me. I didn’t even know I had it,” said Yvonne, a dialysis patient at DCI Warrensburg in Missouri. This statement is all too common among diabetic kidney patients in America. Of the 29.1 million Americans with diabetes, 1 in 4 cases goes undiagnosed. Diabetes, the chronic condition in which there is too much sugar in the bloodstream, accounts for nearly half of the new cases of kidney failure among Americans. These high levels of blood sugar make the kidneys over-filter blood. The extra work is hard on them, causing them to fail prematurely. When the kidneys fail to function, waste build ups, and a kidney transplant or dialysis is necessary to survive. Yvonne shared, “It was 2003 when I went in to the doctor and found out I had Type II Diabetes. At one point, my blood sugar level was higher than 500.” A normal blood sugar range for a nondiabetic is usually between 80 and 100 mg/dl (milligrams per deciliter). When she learned about her diabetes, she also discovered other health issues, including kidney disease and liver failure. She said diabetes seemed like one issue she could work on to delay the progression of her kidney disease. Yvonne began this work by making lifestyle and diet changes to maintain her health. She now maintains a blood sugar range around 120, and while she waits for a kidney-liver transplant, she receives dialysis treatment at DCI Warrensburg. When Yvonne was first told about dialysis, she said she was petrified. After learning more about the process, and eventually beginning treatment, she realized the benefits of dialysis far outweighed the consequences. “Dialysis made me feel so much better, because before, I had no energy to do anything,” she said. When a patient receives in-center hemodialysis, he or she will dialyze three times a week for 3-4 hours at a time. 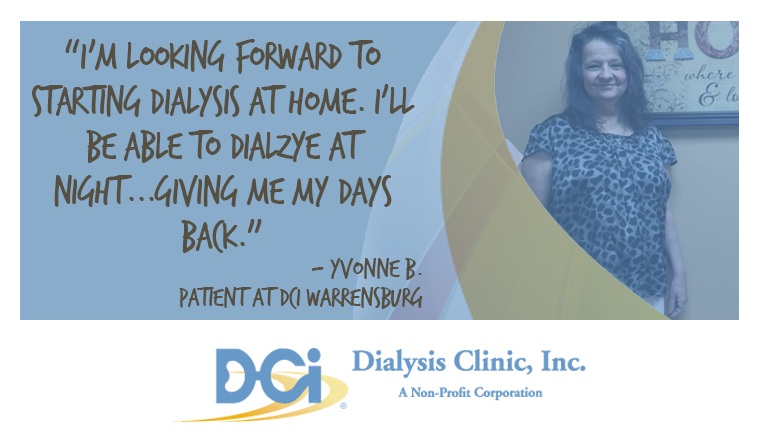 This schedule can create conflicts for work or travel, so Yvonne recently had a peritoneal dialysis catheter placed so she can start dialysis in the comfort of her home. Peritoneal dialysis is a home therapy treatment option which allows for maximum flexibility, where patients can choose to dialyze throughout the day, or overnight. Even though it has been around since the 1960s, less than 1% of dialysis patients choose this option, because many people with kidney failure don’t even know the option exists. “I’m looking forward to starting dialysis at home. I’ll be able to dialyze at night while I sleep, giving me my days back,” Yvonne said. Yvonne said that while she is excited to have the freedom of her days back, she’ll miss the nurses and technicians at DCI Warrensburg.